The Alex Jones Show is broadcast nationally by the Genesis Communications Network to more than 90 AM and FM radio stations in the United States, including WWCR, a shortwave radio station. The Sunday show also airs on KLBJ. In 2010, the show attracted around 2 million listeners each week. According to journalist Will Bunch, a senior fellow at Media Matters for America, the show has a demographic heavier in younger viewers than other conservative pundits due to Jones’s “highly conspiratorial tone and Web-oriented approach”. Bunch has also stated that Jones “feed[s] on the deepest paranoia”. According to Alexander Zaitchik of Rolling Stone magazine, in 2011 he had a larger on-line audience than Glenn Beck and Rush Limbaugh combined. 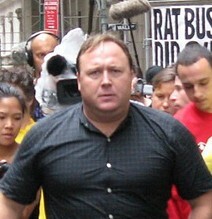 Jones is the operator of the web sites infowars.com and prisonplanet.com. His website, InfoWars.com, has been labeled by media outlets as a fake news website. Infowars editor is Paul Joseph Watson, who also occasionally guest hosts or co-hosts Jones’ radio program. Mainstream sources have described Jones as a conservative, a conspiracy theorist and an outlet for pro-Russiapropaganda[who?]. Jones has described himself as a libertarian and a paleoconservative. Following the 2016 Republican National Convention, Jones and Roger Stone began plotting the removal of Ted Cruz from his Senate seat in 2018 through potential challengers Katrina Pierson and Dan Patrick. Jones supports Donald Trump and has consistently denounced Hillary Clinton. Jones said that Trump called him on the day after the election to thank him for his help in the campaign.